The first time I tried Mee Tarik Warisan Asli was about 2 years back when we chanced upon a branch at Kota Damansara - The Strand area (yes.. we eat around that area a lot 😄) Le husband is a chinese noodle fan (handmade noodles only) and when he saw the branch, he insisted on eating there. Moi wasn't impressed. I don't rreally like to eat at these authentic Chinese Muslim restaurants (Hui Cuisines) because they charge quite a lot for a dish and give you huuuuge portion that is for sharing that you end up either ordering a variety of dishes which can then feed an army OR eating one or two dishes that you have to share. Ok, so back to Mee Tarik @ The Strand - we ate once, I wasn't impressed cos it didn't suit my then very small kids palate. We found the noodles to be too spicy and we never set foot there again. And then.. one day, my husband was being super nice to me and said he will bring me to Melawati Mall as I wanted to check out Rina Salleh's boutique there and delightfully attended to the kids while I shopped. As a gesture of appreciation, I said we can eat at Mee Tarik (don't judge me okaaaaay). The branch at Melawati Mall was spacious and ordering was a breeze. I don't know if they had revamped their menu since my last visit or I wasn't aware of all the dishes offered back then. But, there were fried rice options and egg drop soup for my kiddo that can't stand the heat. So, all was good. I ordered this mainly for my no 1, cos the description in the menu states something like fried noodle but this dish was a bit overwhelming for us. Maybe too much black pepper? and the texture of the noodle is different from the first dish. Both of my sons preferred the first dish over this. This is a snack dish - toothpick lamb. The serving is big really, and its too spicy for me and the kids. We let Le Husband eat it by himself. So, much to my surprise, they have fried rice @ Mee Tarik! haha my kiddo ate a lot of it. So, I am a satisfied mum. I was not a fan then, but am definitely a fan now, if only because of the lamb noodle dish and the dumpling soup! Will definitely come again. 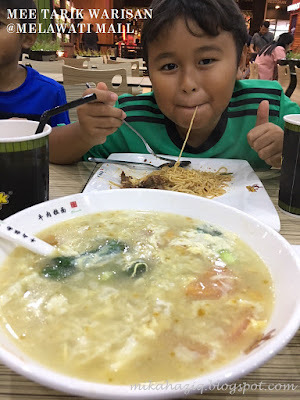 Mee Tarik Warisan Asli have various locations in Malaysia. Check it out from their facebook page here. Kita orang sebelum ni pernah pergi Rumah Makan Cibiuk yang dekat Wangsa Maju tu beberapa kali, sedap tapi tak sempat2 nak tulis entri, tahu2 dah lama nah haha, jadi since yang cawangan Kota Damansara ni baru buka dan kita pun baru juga lah terjah.. jadi blog ler cepat2 sebelum basi. Rumah Makan Cibiuk @ Kota Damansara konsep dia very modern, selesa sangat, tapi kita duduk di meja panjang sebelah pintu masuk.. lampu dia sangat panas 😅 Yang best makan di sini adalah sambal nye yang beraneka, dia letak kat meja tepi je, ambil lah sambal apa yang u nak, tapi haritu I tak ambil sambal sebab dah order bawal masak pedas..
Okaaaay, lagi satu hidangan wajib kalau makan makanan Sunda adalah.. ayam bakar yup yup.. manis dan lembut.. sedaaaap. Kalau tak suka ayam.. nah cubalah cumi pula.. yang ni sedap dimakan masa hangat2.. lembut dan manis, bila sudah dingin cuminya macam kenyal sedikit. Yang ni udang goreng crispy untuk suami dan anak no 1. 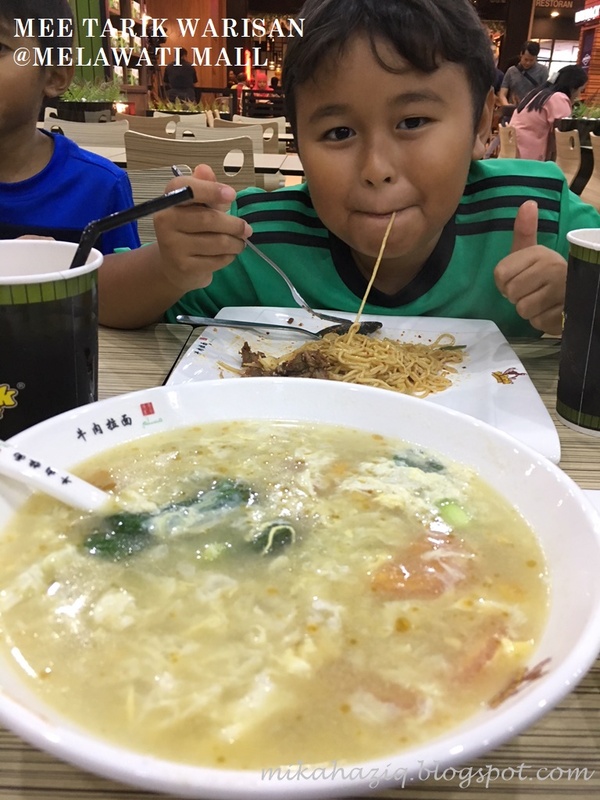 My anak no 1 tu sebenarnya tak makan sangat udang, tapi yang ni boleh pulak dia makan kasi habis haha.. yang ni pun sama macam sotong tadi, bila dingin dah tak berapa sedap. Untuk anak I yang no 2 dan 3, mereka makan nasi goreng.. Ya Allah sedap betul nasi goreng ni, rasa butter dan kicap, makan dah dingin pun masih sedap haha.. tu satay dalam gambar ada satu je, tapi sebenarnya ada dua. Kalau part satay ni, I tak suka versi Indonesia :) I suka versi Malaysia haha. Rumah Makan Cibiuk dibuka setiap hari dari 11 pagi - 11 malam.